League of Legends is a PVP focused MMO where players engage in exciting battles across a handful of maps, each team comprising of a number of different Champions who must fight past waves of enemy minions, sentry turrets and opposition players with the goal of destroying the enemy teams Nexus located in their base. Players are able to gain XP and gold from killing minions, destroying turrets and of course killing enemy players in the battle, with XP a player’s character will evolve and learn new skills or be able to increase the power of their current skills for the duration of a single battle where is gold can be used to equip their characters from the shop with new items. At the end of the game it characters levels and items are stripped from them so that for each battle they start afresh. The available Champions in the game cover a wide selection of different fighting styles to cover different players preferences, from ranged attackers, melee fighters, high defence tank-based characters, high DPS aggressive players, support healers and buffers and more. There are six different roles that a particular Champion can be grouped into; Mage, Support, Assassin, Tank, Marksman and Fighter. Players on a premium paid account have access to every champion available in the game, alternatively those using a free account can only choose champions from those that have been made available in the weekly roster that changes at the end of each week giving new Champions to play. On each map there are one or more lanes available that are rolled is linking the two team bases together, victory is gained by pushing down these lanes and into the enemy base to destroy their Nexus. Waves of AI controlled NPC’s that spawn in a players base and automatically travel down the lanes engaging any enemies that they come across. Minions will typically prefer to fight other minions over players and can be used to farm XP and gold as well as used to overcome the enemy turrets. These defensive towers can be extremely dangerous to any player or minion that comes within range of them, as with minions it turret will target other minions before it targets a player unless the player attacks and another player within range at which point it will switch targets automatically. 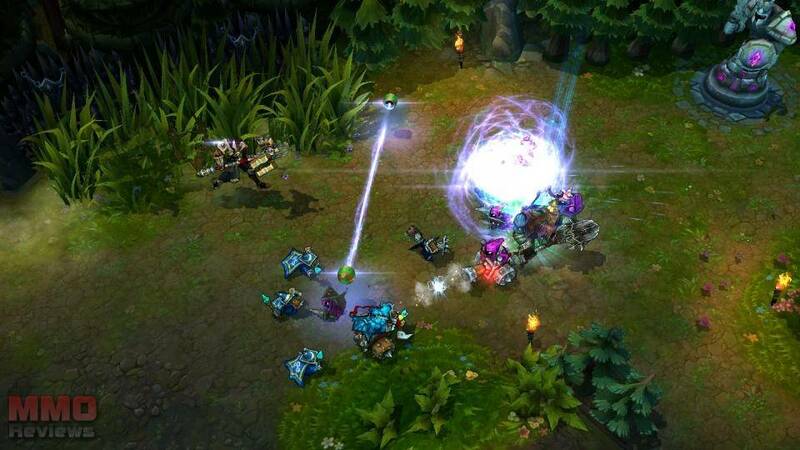 Waves of minions can be used to overwhelm at turret so that the players can attack it and destroy it as they push up the lane towards the enemy base. At the side of each Lane is built up dense jungle area where players are able to hide from the overhead mini map to set up ambushes or keep out of sight as they switch between lanes. Within the jungle there are NPC camps that can be destroyed by either team to give them extra bonuses and buffs. This in a battle players will earn gold when they destroy an enemy or one of their structures, either landing the killing blow or assisting in a Champion kill. With their gold players can use the Shop which is located in their own base and purchase new items which will give them buffs or potions that they can consume. Items can be combined to create more powerful items, so often players will have to purchase specific items in order to create the more powerful weapon or armour that they desire. Looking for more Free MOBA Games games?